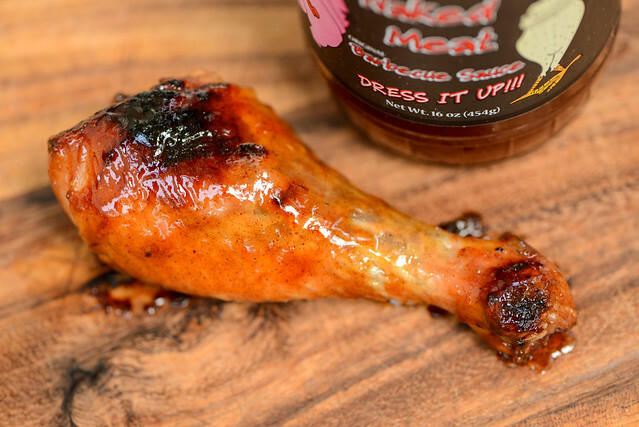 A minimal amount of ingredients gives No Naked Meat a clean and uncomplicated flavor out of the jar, but it ends up losing most of its barbecue sauces traits after being cooked. The first thing that welcome me when I walk into my neighborhood grocery is an entire display of locally produced barbecue sauces. For someone who loves trying out new sauces, I can't help but stop and peruse all the options that I now have available to me. No Naked Meat was just one bottle of that vast selection that I picked up recently. It's produced by Tommie Dale out of Fuquay Varina, NC, south of Raleigh. Tommie focused his sauce of a few simple and natural ingredients to develop the right flavor to go with his home cooked meats. A hearty amount of vinegar greats you with its strong tang on first smell of this sauce. Mixing in with it is a bright and fresh tomato aroma with a fair amount of sugar, giving it a ketchup-like character. There's an onion-y depth to the the otherwise straightforward sauce, and just a faint hint of pepper and heat. This rusty red sauce has a super smooth consistency with a glossy sheen. It's semi-transparent, which makes it easy to see the tons of tiny specs of red pepper and more disparate pieces of black pepper as well. 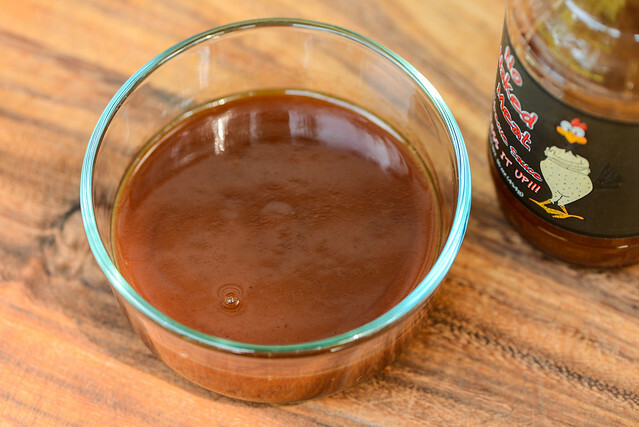 It has a medium-thin thickness and flows in a quick, smooth, and syrupy pour from a suspended spoon, leaving only a very thin coating of sauce left clinging in the end. First taste of the sauce is all sugar, a quality that persists from beginning to end. It takes a few seconds, but a tomato flavor joins the party and, just like with the aroma, gives the sauce and ketchup-y profile. A wave of vinegar comes out next and nudges the sauce more into "barbecue" territory. Mild spices like onion and pepper add a tad more character, but the sauce remains clearly defined by its simplicity between sugar, tomato, and vinegar. In the end there's a mellow heat that's just enough to tingle the tongue and create and sweet and spicy aftertaste. The sauce coated in a very thin and pale layer that only gained substantialness after a few additional brushings over indirect heat. Once moved to direct heat, the sauce quickly burnt, leaving a large swath of char on the chicken leg. Luckily it didn't taste burnt, but it also didn't taste too much like anything. The sauce was mainly sweet and tangy, but any nuances of spice and heat were lost after cooking. Although a somewhat random choice, I did notice No Naked Meat was thicker than the predominantly thin vinegar sauces that line the shelves at the grocery store, and that made it better suited for my established testing guidelines. North Carolina isn't known for their tomato-based barbecue sauces though, and No Naked Meat is a kind of a demonstration why. While there was nothing particularly wrong with the sauce despite some charring on the grill, there was nothing very exciting either. The minimal ingredients gave it a clean, uncomplicated flavor. That could certainly be a draw for some, but it made for a rather ho-hum chicken leg in my opinion. The flavor out of the jar was definitely better, where the spices added both complexity with oniony notes and heat, so I would use this sauce preferably as a condiment or a finishing sauce for wings or even veggies.